Since I don’t know when my little man has had a unprecendeted fear of the ocean. He does not mind the tide pools but the mere sight of the ocean waves rolling makes this sweet little blondie of mine stutter and shake with true fear. This aversion is not limited to him going in the water either. It includes both Rowan and I respectively. If I even so much as dip my piggy toe in the vast ocean that boy honest to goodness panics. He begs and screams for me to come back. He wails. He claws at the sand. It is plain old sad to watch. So what else can I do but come back and play safely on the shore with my little man. I tried all sorts of recommended tricks none of which even came close to easing his mind about the tumbling waves. Well todays beach outing included a little buddy. And it proved to be just the remedy. Perhaps it was the peer pressure or just the visual understanding that yes, you will survive if you play at the shore. 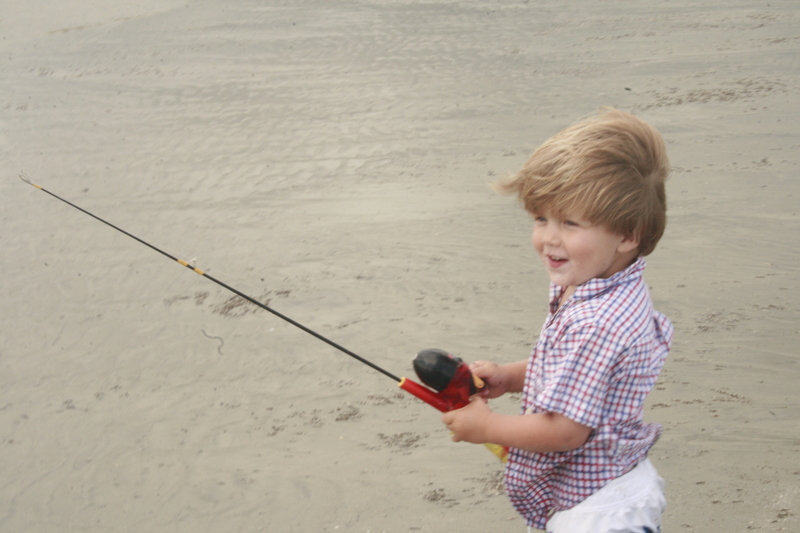 But my little man inched his way down to where the tide meets the beach and what else; fished. He looked up at me and said in Miles fashion, “My did it. My not afraid of the ocean anymore!”. This entry was posted in adventures and tagged beach, children, fear of ocean. Bookmark the permalink. good job my little miles, you will be surfing with your uncle T before you know it!